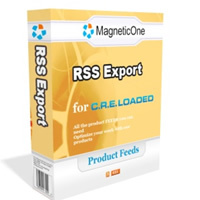 CRE Loaded RSS Export is a Contribution, which allows syndicate products from your CRE Loaded store to use popular syndication formats. RSS is open file format for information export, which is used by variety of sites/services, RSS-aware software and most popular internet browsers (like Firefox, Internet Explorer, Safari etc.) to review and import your products. ... MediaThink: RSS: The Next Big Thing Online (an introduction to RSS implications for business) ... Wired Magazine: Aggregators Attack Info Overload ... CNN: Welcome to the 'new' Web, same as the 'old' Web Main features: ... ready for RSS marketing campaigns ... multilanguage support ... ability to export into 3 formats: RSS 0.92, RSS 1.0, RSS 2.0, RSS 2.0 Edgeio Additional feature: ... You can export this feed to Edgeio, to get additional exposure!